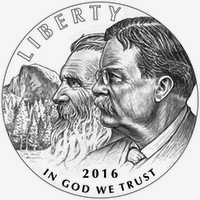 2016 NPS Centennial Commemorative Gold Coin Announced! 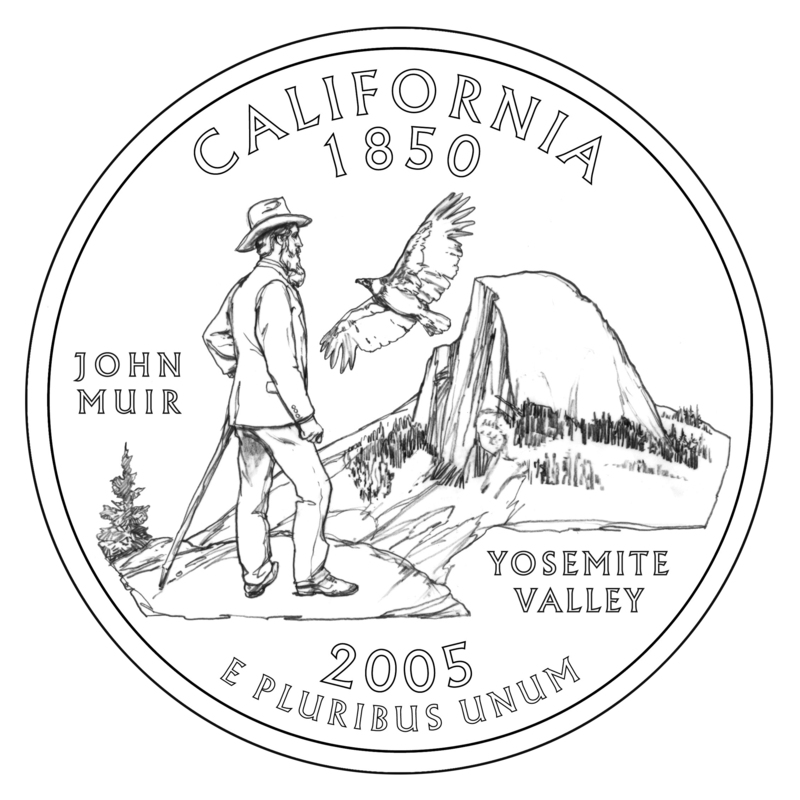 The 2005 California State Quarter issued by the United States Mint, depicts naturalist and conservationist John Muir admiring Yosemite Valley’s monolithic granite headwall known as Half Dome with a soaring California condor. On March 29, 2004, California Governor Arnold Schwarzenegger announced his selection of the John Muir- Yosemite design to represent the Golden State in the U.S. Mint's 50 State Quarters ® Program. The design was adapted from a concept by Garrett Burke. The U.S. Mint released the coins for only a ten-week period in early 2005. They are now found in normal circulation, and through coin dealers. The U.S. Mint began minting the state quarters since 1999 and has scheduled five quarters to be released each year -- running from the Delaware quarter on Jan. 4, 1999, until the Hawaii quarter on Aug. 21, 2008. 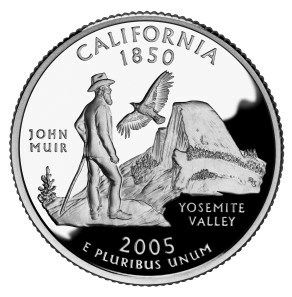 The California state quarter is the 31st in the series to be issued. Check back on this page for frequent updates. Scroll down for lots more information! Garrett and Sarah discuss their involvement in the Quarter Project. The Design submission and selection processes are discussed. Using the State Quarters as an educational tool. United States Mint Catalog - (off-site link). The United States Mint offered a variety of products, not only collectible coins themselves, but various other collectibles featuring the California quarter, including a collector spoon, a First Day Cover, and many related items. Many of these may no longer be available from the U.S. Mint, but can be found on Ebay and coin collector shops. 2005 United States Mint 50 State Quarters Proof Set™ - January 6, 2005 - from the United States Mint (off-site link). See also newspaper article: US Muir coin designer in Dunbar - "AN AMERICAN [Garrett Burke] who designed a 25 cent coin in memory of Dunbar-born conservationist John Muir has said that East Lothian 'looks a million dollars'". (offsite link - East Lothian Courier, July 30, 2009) Note: this article incorrectly states that Burke helped create the sand sculpture above, but everyone involves affirms the sand sculpture was solely the creation of Jo Moulin and Duncan Smeed.